An exclusive thatched Conference venue is situated in the evergreen garden next to the swimming pool. The venue accommodates 5-12 guests depending on the seat layout. 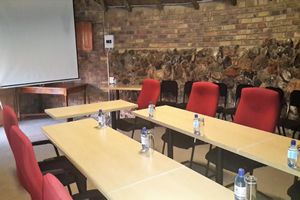 The Conference room is fully equipped and is very popular for business seminars, training, small conferences and those who prefer total privacy and quality service. Free wireless (Wi-Fi) internet available on premises.